These are the socks that help prevent lower leg cramps using infrared Radiance yarn rather than compression. 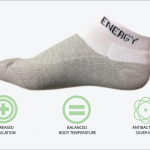 The socks are woven with a thermo-reactive mineral matrix that converts body heat into therapeutic infrared light that is reabsorbed back into the skin, promoting increased blood flow. They can be worn during exercise to improve performance and endurance, and worn overnight to help speed recovery. 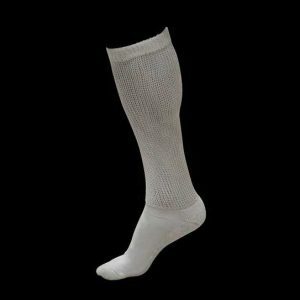 Unlike compression socks that can be difficult to put on, these knee-length socks slip on like any normal pair. Also provides relief for cold feet or circulation complications and helps control moisture and odor. Far infrared effect will not wash out or diminish with wear. Save when you buy a 3-Pack of socks! Save $20 when you buy a 3-Pack of Cramp Buster Sox! Select this option on the shopping cart page. SKU: n/a. 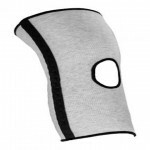 Categories: Infrared Athletic Gear, Infrared Recovery Apparel, Infrared Sleep Recovery. Recycle the body’s energy using infrared Active Technology. Increase oxygen and blood flow when being worn. Help relieve joint and muscle pain through better blood flow. Regulate body temperature to keep you cool or warm as needed. Ease fatigue when you’re sitting for long periods of time. Enhance performance during physical exercise. Improve athletic training sessions and endurance. Help reduce back pain by increasing blood flow. Help the body efficiently recover during sleep with quicker entry of REM sleep. Never wash out, the benefits are maintained for the life of the product.